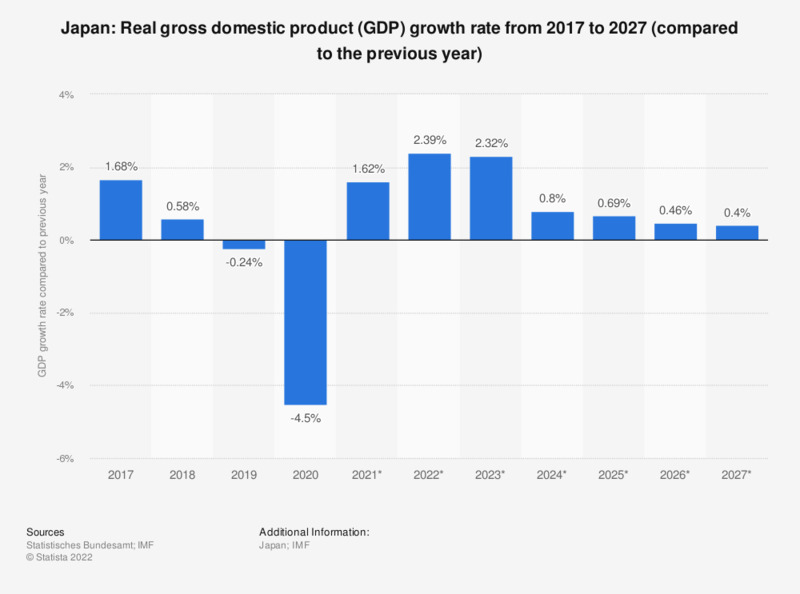 The statistic shows the growth rate of the real gross domestic product (GDP) in Japan from 2012 to 2017, with projections up until 2022. In 2017, Japan's GDP increased by 1.74 percent compared to the previous year. For comparison, the GDP growth rate of China had reached about 7.3 percent that same year. GDP serves as one of the most heavily relied upon indicators to gauge the state and health of a country’s economy. GDP is the total market value of all final goods and services that have been produced within a nation’s borders in a given period of time, usually a year. GDP figures allow a more fundamental understanding of a country’s economy. Year-on-year GDP growth acts as a helpful and clear sign of the direction in which a country is moving in economic terms. Real GDP is especially useful and insightful as it takes price changes (inflation and deflation) into account. The gross domestic product growth rate in Japan has been shaky since the recession of 2008 struck the world economy like a bolt out of the blue and Japan is still yet to gain a solid foothold. Despite its ongoing financial predicament however, Japan remains one of the world’s most highly developed economies. The economy of Japan is the third largest worldwide by nominal GDP and the nation has a very active manufacturing sector. It is active in the auto manufacturing sector, the third largest in the world after the United States and China, and has an electronics industry that is counted among the worlds most innovative. Japan can boast many titles, but perhaps the most significant to its future stability is that which relates to its astronomical national debts, currently running at over 200 percent of GDP, roughly 10.5 trillion US dollars. Everything On "Economic Outlook Japan" in One Document: Edited and Divided into Handy Chapters. Including Detailed References.